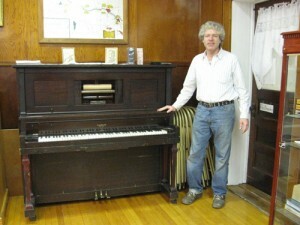 Ben’s Player Piano Service is a business I started when I was in high school in 1976. The family player piano was a very early Knabe with a Wilcox and White “Angelus” player system. It sat unused for many years and one day I decided to see if I could get it working again. This project and my general fascination with all things mechanical lead me to a career in pneumatic action repair and restoration. Through the years the business has evolved into a full time service for all kinds of pneumatically operated instruments including reproducing pianos, nickelodeons, band organ and dance organs. I also offer customers throughout the US and world with a service where parts can be shipped here to the shop for repair without sending the entire instrument. Nationwide pick up of entire instruments is available as well should you wish to have the complete job handled here in the shop. The work is done entirely by me so you can be assured of the highest quality standards. All workmanship is done using materials and techniques similar to those employed when these instruments were first manufactured. It is my endeavor to provide to you, the mechanical music owner, with a musical experience you can enjoy for many years to come.